Singlemode Quad Channel 3G/SDI, HD/SDI Fibre Optic Transmitter Module, Auto-Sensing for SDI, ASI, HD/SDI and 3G/SDI. 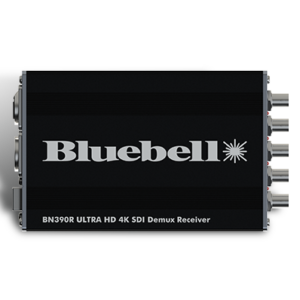 Expanding upon the successful BlueNano range the BN366 is designed for the cost effective transport of 4K UHD signals over fibre. 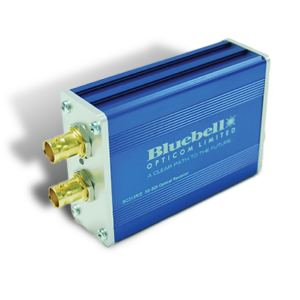 Based around field proven technology the compact units provide the transport of 4 x 3G-SDI signals over a dual fibre link. 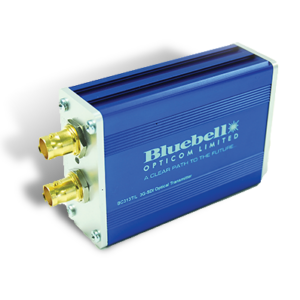 The BN366 also provides a compact conversion unit which allows the outputs from up to four cameras to be transmitted over fibre. Units are fully compatible with the BC Series of modular cards and frames allowing units in the field to be integrated into the main OB or CAR network. Each signal within a fibre core has a different optical wavelength, enabling interference free transmission over longer distances. 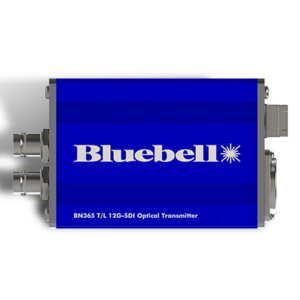 The BN366 is also available using CWDM technology where the 4 x SDI signals are multiplexed onto 1 fibre port. Power is provided via the compact PS12 unit. 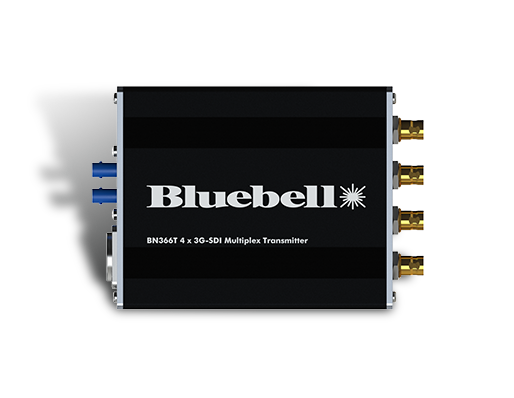 Each BN366 has a 4 pin XLR allowing power from a variety of external DC sources in the range 4.5 to 17 V.
Units can be used in conjunction with any standard Bluebell frame or enclosure, for example, allowing a remote BN366T in the field to integrate easily with a 19” frame in the OB truck. The BN366 is the complimentary video transport to the Caddie-LB 4K, a fibre transport system for users wanting a complete system transport to include comms, camera control and genlock as well as video transport.